Wearing these jeans, this top, these sunglasses and these sandals. The Belmond El Encanto is nestled among 7 acres of lush tropical gardens and boasts an impressive ocean view from the hillside terrace where meals are served. The rooms are cozy cottage style with plush bedding and spa like bathrooms. Tip: There is a shuttle offered to guests into town, otherwise a car or taxi is necessary. In Montecito, San Ysidro Ranch is a gorgeous hideaway with beautifully landscaped grounds. The Four Seasons Biltmore is a historic property set on a lush plot facing beautiful Butterfly Beach. The grand lobby has stunning mosaic work and feels richly Spanish. Guests can take in a game of croquet or head over to the Coral Casino Club for laps in the Olympic swimming pool. Tip: Check out Bella Vista for happy hour. The Kimpton Goodland in Goleta is a great, reasonably priced option. There is a lovely pool area to while away the hot days. The public spaces are well designed and the on-site restaurant is delicious. 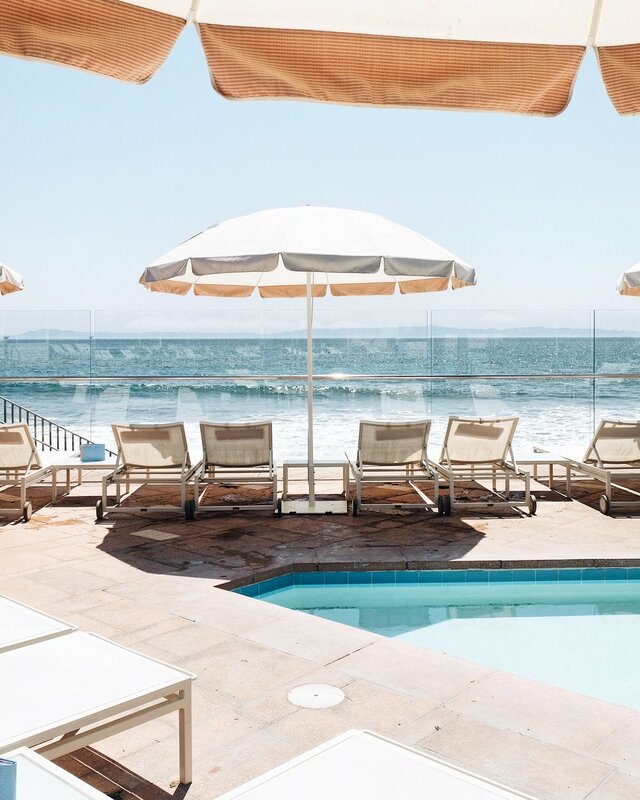 The Bacara Hotel is a sprawling waterfront property with a large pool area and deluxe spa. Wearing this cover-up and this hat. Wearing these sneakers, these jeans, this top and this hat. The Lark is located in the “Funk Zone”, a smattering tasting rooms, cafes and galleries housed in converted warehouses. If you aren’t able to snag a reservation, head over early and settle in at the bar. The menu is a reflection of seasonal California cuisine, but the crispy brussel sprouts spiced with garam masala are not to be missed. The Honor Bar in nearby Montecito is cozy with perfected stand-bys like guacamole and a killer chicken sandwich. The Boathouse at Hendry’s Beach wins for best location with unbeatable ocean views, especially during their sunset happy hour. The margaritas and tuna poke are delicious. The French Press is the perfect light and airy cafe for your morning cuppa and a little something sweet (all the pastries are homemade). Santa Barbara Public Market is very much a work in progress with additional vendors being added slowly but surely. During our visit, there wasn’t much to chose from, though the Empty Noodle Bar was a hit. McConnell’s Fine Ice Cream is a Santa Barbara institution, serving small batch scoops since 1949. Try the Santa Barbara Strawberry. A day at the beach is easy enough here in Santa Barbara. Butterfly Beach is a local favorite, but you’ll need to pack a picnic as there are no concessions or facilities. Spectacular homes and gardens are standard fare in these parts, but few are open to the public. Casa Del Herrero is the rare exception and offers small group tours daily of the 1925 mansion of St. Louis businessman, George Smith. Montecito Country Mart has some great shops like Jenni Kayne and Upstairs at Pierre LaFond for interesting, global finds. Inspiration Point is an easy hike with rewarding views. Check out the Santa Barbara Farmer's Market for delicious produce from nearby farms.